Since TANIQ was founded, continues development and innovation have been a key principle. The result, is a continuously evolving and expanding technology platform including unique solutions, systems and technology as well as extensive expertise. Part of TANIQ's services and products are customised robotic set-ups to automate the production processes of reinforced rubber products. Thanks to this continues development, the Scorpo Robotic systems, tools, equipment, controls and programming are enhanced and refined. TANIQ uses various industrial robots to apply materials fast and accurately. Automated material winding is a different approach to conventional manual production. The materials themselves are not significantly different (the rubber compound and tape are the same). However, the physical form and process in wich the materials are supplied and placed is significantly different from manual production. Instead of frabic sheet, single cords are used. In stead of rubber sheets, rubber strips are used. And tape is supplied from a spool on the robot tool. These changes make robotic automated winding processes possible. TANIQ has developed mulitple special cord winding tools that are connected to the end of the robot arm. Using individual cords with an optimum structure instead of conventional sheet material brings significant advantages. The main function of the fcord winding tool is to guide the cords from the tensioning equipment to the product. The design of the tool is determined by; the number of cords it has to guide, the type of cord construction and by the shape of the product that needs to be wound. To prevent friction and cord damage during winding, the rollers and eyelets used are made of special (coated) materials (e.g. ceramics). TANIQ has the expertise to design the optimal cord winding tools for each product. Special Rubber Winding Tools have been developed for automated placement of rubber. TANIQ's technology uses rubber strip winding to enable accurate, efficient and fast automation. Therefore, changing from rubber sheets in the conventional manual process to strips is required. The rubber strip is wound on plastic spools which can be easy loaded on the tool. The rubber tools have been designed for maximum compatibility with different compounds. The tools can be used with various rubber thickness and strip widths. The rubber tools (like the other tools) are continuously improved. The Tape Wrapping Tool is connected to the end of the robot arm. The wrapping tape is wound on plastic spools or a metal axis which can be easily loaded on the tool. The main function is to obtain a high and uniform tension in the wrapping tape during winding to enable a consistent and constant pulling force. This results in a consistent product quality and visual appearance. An extra functionality is unwinding a previously wrapped layer back on the spool. This function is especially useful in winding processes of large diameter hoses with multiple reinforcement layers, which requires wrapping in between the layers to press out trapped air. During the robotic winding process the tension in the cords should be constant to obtain a high and uniform product quality. 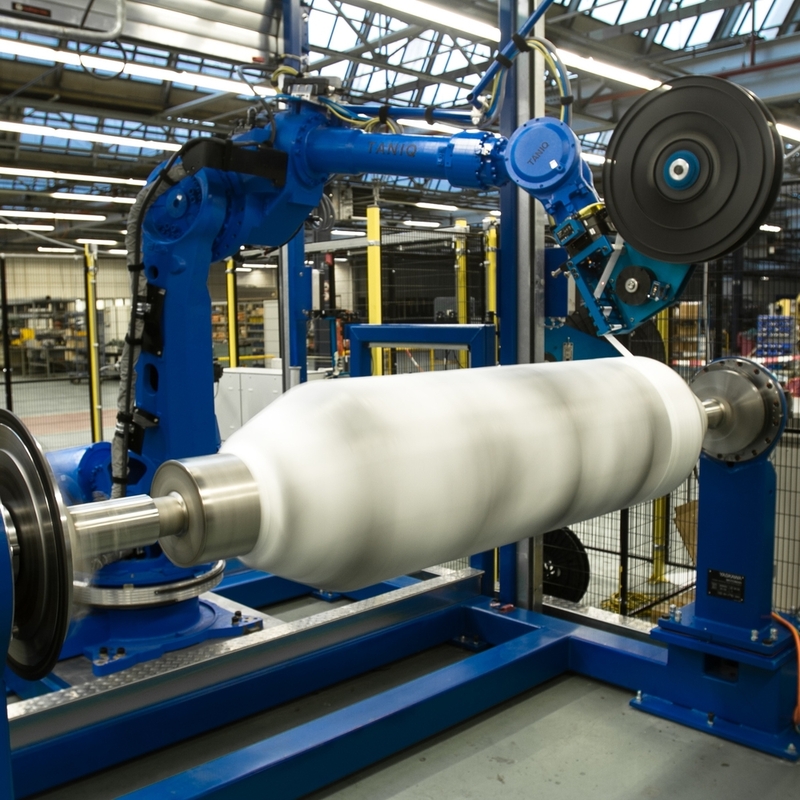 Keeping the cord tension constant is challenging for production of complex shaped products, resulting in exterme robot movements and high accelarations and deccelerations. TANIQ supplies tensioning equipment of renown suppliers customized to TANIQ's robotic winding processes. Furthermore, Therefore, TANIQ has developed own tensioning equipment that keeps the tension constant even at high winding speeds, accelarations and decelarations, and when using sticky rubberized cords. In the design of the equipment rollers and special (ceramic) coatings are used to prevent friction or abrasion of the cords during the winding process. This way the best cord tensioning equipment can be selected for each production process. To preview the robotic winding processes TANIQ simulates the processes using software such as MotoSIM and Robot Studio. With all the correct settings the simulation will be a 1:1 representative for the actual winding process and production times of your robotic cell. TANIQ uses this simulation to optimize the configurations of the robot cells, for reachability studies and to check for collisions between robot and mandrel.